Hidden Gem -- 1,000th Challenge! Message edited by author 2009-03-21 12:34:33.
tu as fais un trés bon travail avec cette image, comme toujours. Elle aurais dû être meilleur placée, mais surement les ânes, ils n 'ont pas aidés le suffisant. Un poco errada la redaccion en frances pero estoy totalmente de acuerdo con el mensaje. Great picture bro, deserved a first page showing. This is beautiful! Going into my favs! stunning image. Amazing lighting and wonderful capture of scenery. Beautiful photo! Just wonderful image here. Excellent choice of perspective to make it visually interesting, and the colors are just perfect. Already in my faves. Good luck! Great shot of colors and culture. Very nice composition and I love the light in this image. Nice colour and texture in this shot. Nice shot. Simple and good angle and colors. Great POV, color and detail. The pose of the boy is extraordinary. aha! there you are! took me a while to find your work in this sea of images. I like this shot a lot (especially the awesome colors) but I don't know if this is your absolute best work (based on what I've seen in your portfolio) good luck! great shot, saturation works, but just a bit oversharpened? I see some halo around the foreground boy especially. This makes me think of Peru or Central America. It's so clear and sharp, very interesting and a great composition. Back to vote, I gave this an 8. Great rustic feel to this image. Beautiful bright portrait of the boys and their donkeys. Very effective with the motion and attention. Looks like work starts early in these kids' life. Very nice picture, and capture of a moment in their lives. Great colors. The boy on the right seems so thoughtful and determined. I like it a lot. Love the way the figure is looking off out of the shot. A walk back in time. Nicely processed. The closer boys expression and upturned head causes the viewer to wonder what he is looking at. That boy on the right is the most amazing thing about this picture. What a pose!! This looks like it is probably a snapshot, but it is truly a great photo. The look on his face says a lot. This one snuck up on me. A very different shot and in a very good way. Really captures a feeling for the place. The composition is perfect and so is the lighting. I like the angle you were shooting from too. what awesome characters- the sky is just perfect for this. nicely done. Wonderful! I like the scene... the processing... the sky... and especially the one boy who stops to contemplate life. This has a National Geographic quality to it. Great image, among best of show. Nice and crisp. Love the right kid's stance, defiant against the sky. I love this, the lines, the lighting, the textures, wonderful! The slight tilt adds to this shot. Good clarity and nice colors. How did you get both the sky and your subjects to look so good at the same time? Great tonal range throughout the photo, great detail and sharpness. Great shot, the coloring is so nice and vivid. I'm enjoying the clarity of this image. It almost looks a little too 'studio' for me though. Not sure how else to explain it. Great impact though. Spectacular shot! The blues in the sky are very deep and the undulations in the clouds lead your eye in the direction straight through the image. Everything travels to the left except the point of origin, which is the young person standing contrapposto with a stern expression. And he is lead through by the hint of a background in the distance behind him at the foot of the hills. Great image of these guys at work moving their asses along. Beautiful blue sky as a background. Very nice. Great colors and details here in this rural farmland shot. I really like this capture for it tells the story of this place plus gives you a sense of 'experiencing' it - the only thing missing is the National Geographic story attached to this photo:-) I love how you captured the stance of the boy in the forefront as he has stopped to scan the horizon - a sort of lookout scout. 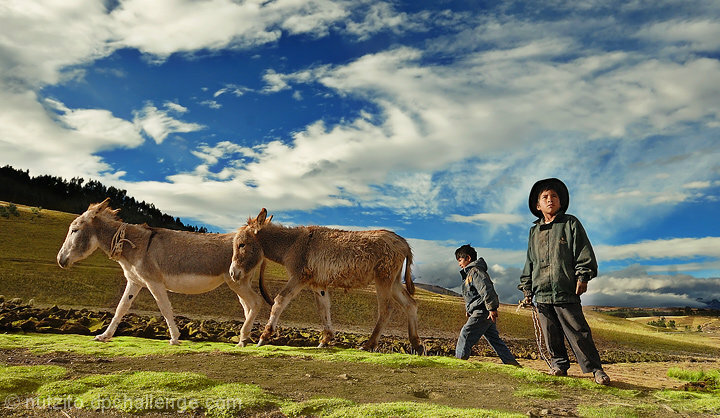 The boy walking behind the two burros/donkeys is the herder. He makes sure that the donkeys stay together and do not stray to far. I wonder if these two boys are taking the donkeys back home or are venturing to the market perhaps to sell them. Well done - 8. I LOVE THIS!!! The perspective is incredible and ironic, especially since one of the children is striking such a manly, strong pose. The fact that the donkey's are also small it makes the kids look more grown up. The colors and lighting are fantastic and the wide angle look also contributes to the funky distortion of scale. Very nice. Beautiful colors and story. Love the kids and the one looking up at the sky is great. My first vote and comment today,I like the foreground childs far away look. I had to use Google to translate this to "The Way of the Shepherd" - hope that is accurate. The expression on the lad is captivating. Well done! Great shot of young men at work. Proudly hosted by Sargasso Networks. Current Server Time: 04/23/2019 12:13:49 PM EDT.